Review of the book, A Dictionary of Syrian Arabic: English-Arabic: English-Arabic edited by Karl Stowasser and Ani Moukhtar. Kern, Kristen. 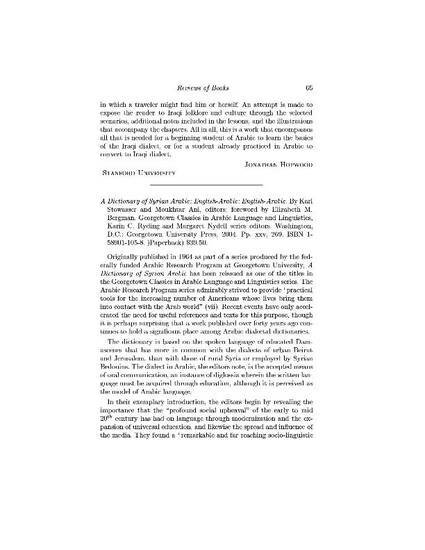 Book review of “A Dictionary of Syrian Arabic: English-Arabic: English-Arabic.” By Karl Stowasser and Moukhtar Ani, editors; foreword by Elizabeth M. Bergman. Georgetown Classics in Arabic Language and Linguistics, Karin C. Ryding and Margaret Nydell series editors. Washington, D.C.: Georgetown University Press, 2004. Published in MELA Notes, Number 80 (2007): 65-67.